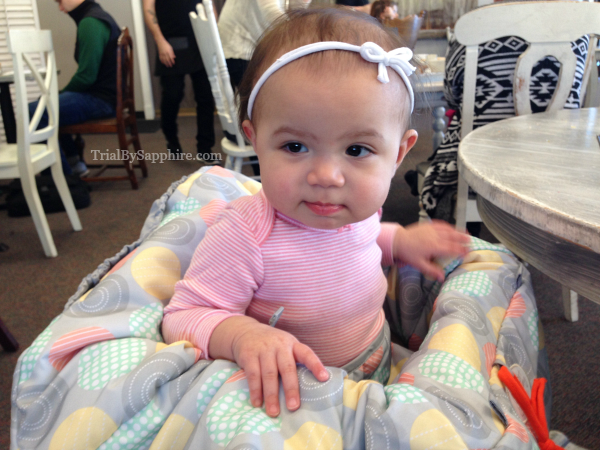 Trial By Sapphire: Sweet P: One Year Old! 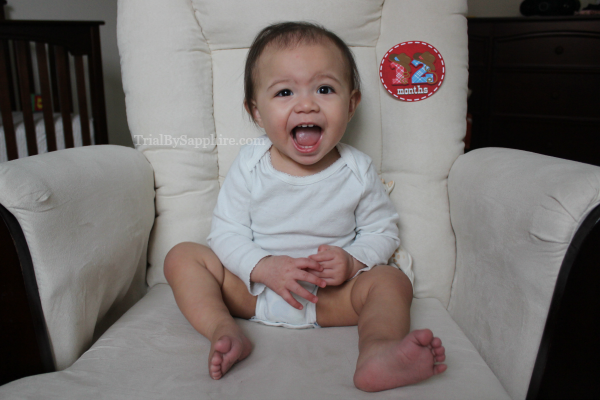 Sweet P: One Year Old! Well, she is one year and two weeks old as of today. Like last month, better late than never! What a year! We hardly remember how small 6 lbs., 9 oz. felt in our arms, and it's been a bit surreal to see all of her monthly photos in one collage. Look at that precious little nugget at one month old! She officially started walking on 2/16. It was exciting to see her on a roll, and just two days later, she was steady and quick! We could tell she had been ready for weeks but wasn't sure of herself. Sometimes we tricked her into walking to us with the help of food and toys. We moved to Nashville just after she turned 11 months old. She handled the move to Nashville like a champ. Well, not the actual move. I had to pull over twice on the drive from Memphis, but she settled in at the new house just fine. I spent too much time concerned about how the move, empty walls, differently configured furniture, and new surroundings would jack up her routine. She didn't give any of it a second thought. Babies are resilient like that. She has mastered getting down from the couch and the stairs. Her seventh tooth came in on 2/9. She had been chewing on her fingers and drooling a bit for about a week before, so we knew the next teeth would be coming in soon. Her eight tooth came in on two days later. She is very good at communicating. I think it's a combination of us understanding her cues really well now and her consistency with signing. She shakes her head when she doesn't want something we offer. The tone of her babbles vary and mimic the sounds that we make. She "sings" with us -- which means that I sing two notes, and she sings or hums them back. She purposely forces laughter to carry on with us. 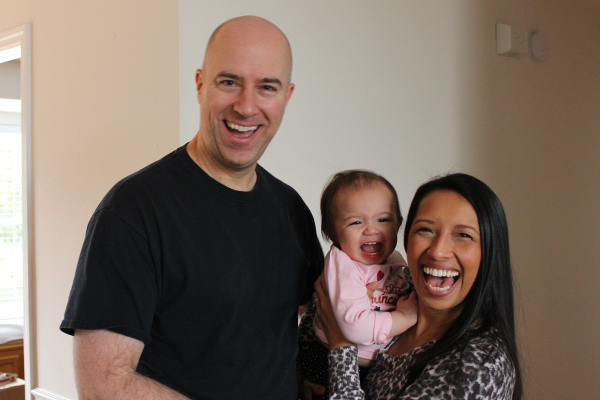 She made a facial expression that had us cackling, and when the moment subsided, she pretend-laughed... which then made all three of us laugh. When I was pregnant, I remember joking to S, “Wouldn’t it be so terrible if she didn’t have a sense of humor? That would be terrible! All the fun in this house would be completely wasted.” Consider my fear eliminated. New foods this month were olives, tomato, and sweet potato. It had been awhile since she had quinoa, so we tried that again too. She still likes it! She has started putting things away which was a nice surprise. Not only does she remove things from my bathroom drawers, but she puts them away too. Usually in the wrong drawer, but you know, I appreciate the effort. Happy (belated) birthday, Pres! We love you so much! Your smile is still so gorgeous! You look like such a proud mama in that video, and I know you are! I love all of the photos! I got a good chuckle out of the photo where Presley had "that look". She took after her mama! Big flirt, that little one! Wow, it makes me emotional! What a year! I feel like I was just reading her birth story. Congrats on a beautiful, happy, healthy, loving baby. You guys are great parents!